Accommodation in pleasant and cozy feel with homely atmosphere in a quiet place in the middle of a mountain meadow surrounded by trees. 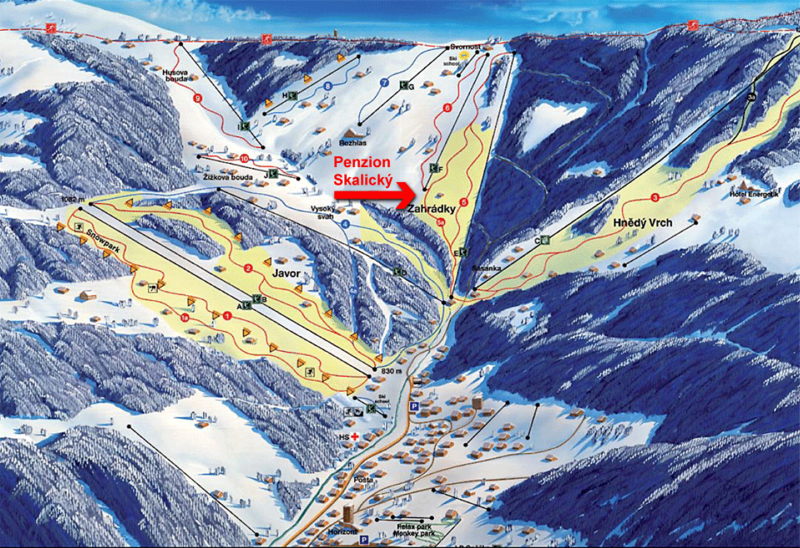 The pension can be found off the main road from Pec pod Sněžkou to Zahrádky a Lučiny, not far from the marked tourist paths, right on the slope in the ski resort SKI Pec. There is a beautiful view of Sněžka, surrounding mountains and Pec pod Sněžkou right from the pension. In summer you can set off for a hike, go for a bike ride, pick raspberries and blueberries near the pension, pick mushrooms in the near forests, or make best of some of many further tourist possibilities in Pec pod Sněžkou. The forest and mountain meadow smells, its peace and the fresh air will add the right essence to your visit in Krkonoše. In winter the snow-covered hills become paradise for the lovers of skiing and all the other winter sports and activities. There are possibilities for everyone, for downhill and cross-country skiers as well as for snowboarders. The pension is modified for the handicapped, non-smoking, offers a services for bikers and free WiFi.